Yellowstone Treasures - An informative guide to the treasures found in America's first national park, including Yellowstone's geysers, animals, history, and geology, written by author Janet Chapple. 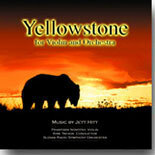 Yellowstone Wilderness Publishing - Publishers of Jett Hitt's Yellowstone for VIolin and Orchestra. Halo Ranch Outfitters - Great horseback riding on the remote west side of Yellowstone National Park.